William F. House, D.D.S., M.D. William F. House, D.D.S, M.D. In the 1960's, Dr. William House developed the first cochlear implant, providing the opportunity to hear for deaf and hard of hearing patients whose condition could not be improved by hearing aids or other means. His first patient was implanted in 1973. Dr. House was the founder of "Hearing for Children", a 501(c)(3) non-profit charitable organization that was dedicated to making cochlear implants available worldwide to as many needy and deserving deaf children and adults as possible. Funding was through outright gifting of implants, providing low or no interest loans for their purchase, and by promoting cost-effective research to create low-cost, high quality, safe and effective cochlear implants. Dr. House's dream was that all profoundly hearing impaired children around the world would some day receive a cochlear implant. It was also his dream that all newborns with significant hearing loss would be identified and treated as early as possible to faciliate their hearing, speech and language development, and intellectual development. It was his way of trying to make the world a better place for all. Cochlear implants - he researched and developed the first commercially available cochlear implant, the House 3M CI, later known as the All Hear CI. Cochlear nucleus implants - also called "Auditory Brainstem Stem Implants" for patients without auditory nerves. The fourth ventricle of the brain is implanted with electrodes. Dr. House died on December 7, 2012 at the age of 89 years (1923-2012). He was a quintessential visionary, medical pioneer, thoughtful thinker, teacher, mentor, and friend. 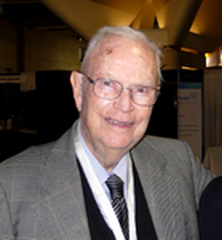 "Dr. Bill" advanced the field of otorhinolaryngology more than any other single physician in history. We are forever indebted to him. All of his mentees miss him, his straightforward manner, and humble approach toward his quest of furthering our knowledge to help our patients. Shortly before he died, he gave his full support to the development of the Sleeping Baby Hearing Test App. (1) House WF. Forty years of ear after ear, year after year. Otolaryngol Head Neck Surg 1996;114:717-719. The Struggles of a Medical Innovator: Cochlear Implants and Other Ear Surgeries, A Memoir by William F. House, D.D.S., M.D., Charleston, SC. 2011, 195 pages. ISBN: 1461046378, ISBN-13: 9781461046370. Read more about Dr. House at Wikipedia.